Can the heater core be replaced with out removing the box assy. A/C don't holds charge don't want to open it if I don't have to. If you have air you cannot service the heater core without pulling the box out and you will also need to pull dash to make it a much easier job. The dash is not a big thing take the pad off the top and you can see the attaching bolts on each side. There is a brace on the left side of the glove box and there are brackets on each side under the dash. Maybe a dozen fasteners all together. You can get by with just sliding the dash back but you can take dash out and clean everything up. You need to pressure check the heater core before install I have had two bad ones out of the box in past. I also repaired my air cond. when doing the heater core. My first got the gauges and vacuum pump at Harbor Freight for less than shop wanted to just evac and test the system. Pull the front seats out first and be very careful getting the drain hose unhooked so as not to break the heater box case. They sell foam kits to repair foam on the doors inside the heater box. I also install the wire mesh over the opening coming from the cowl to keep mice out. You can reach up through the cowl hole and add some sealer or POR around to stop the rust and leaks. Got to the WCCC West Coast Cougar Classics web site and he has video showing how to get the case apart. If you do not do right you will break it. Scrub it out good and if in bad shape you can spray with satin clear to make look new again. Search the forum some should be lots of info. You can do in a weekend if you have manual to show where the bolts are. There is one hidden under the steering column that you have to drop but not remove. It is just bolts, screws and nuts not rocket science. If you have lost the charge in the air there is no problem to unhook. Be careful about twisting the joints and hold both sides with wrenches at the connections. 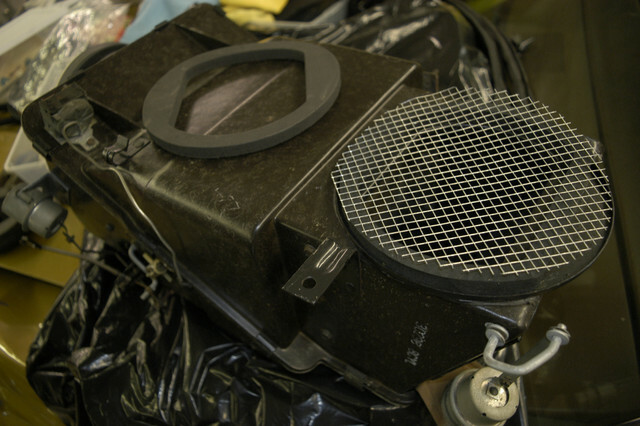 I also put the mesh wire underneath the cowl vent grills. Check inside your cowl with light and mirror usually lots of nuts stored and might be a nest in there also. You can put Stainless Steel post scrubber pads in the two cowl drains one on each side and nothing will ever get in again. I have priced doing this job for $500 in the past. I do not have time anymore, lol. I'm one of these lucky guys who had to replace this unit on each of my Fords. This thing is the center of car, its like ford put a heater core on the floor and build a car around it. or have a door inside under the box so you can drop it beneath. The only thing it needs to do is being in there and release heat. 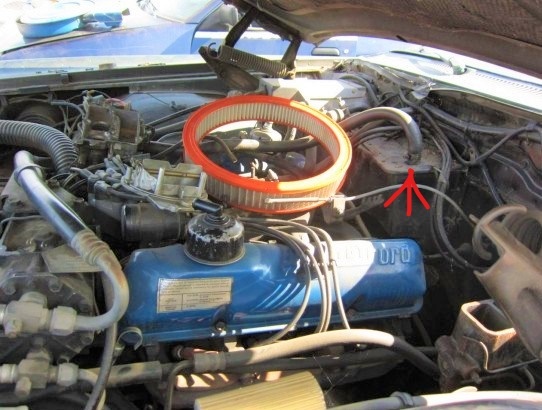 Its not connected to anything but the tubes you see in engine bay. Its hours of work just to get enough space to do something similar as changing AA batts on some electric device. Last in date was on my t-bird 93. Its nearly the identical procedure as on the 7173. Same pain. If of any help, you do not have to follow the procedure by the book. 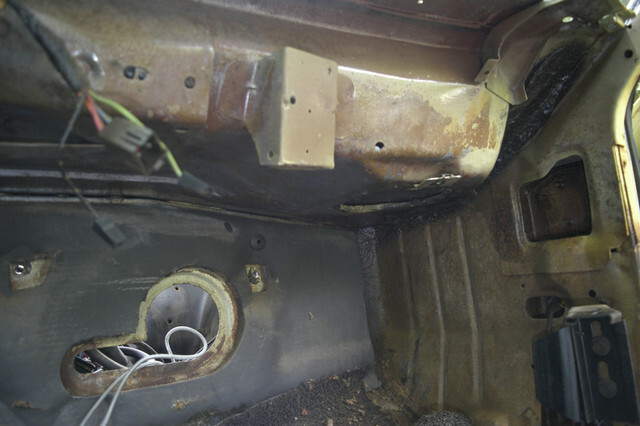 The key is to get the dash free from both holding brackets on both sides, you can then move it in-wards the car a few inches or lift it when required, so column to dash, top/cover of the dash and console are the only thing that need be removed. That gave me just enough to put my arms/hands in there. (one of the few advantage to be a small person) You will say bad words very often and you will have muscle pain the next day for sure, but plastic being plastic you can force/turn/push here and there and finally get to replace it. The "by the book" method is very questionable, at least on t-birds, as its basically telling you how to put your entire dashboard apart and its really not necessary. The tech designers behind this should be sentenced to service heater cores non stop a week long! Fabrice, I'm a dedicated True Blue Ford Fan as you will ever find. But...having to change a heater core in any late model Ford (especially if I was a line Tech) would almost make me consider switching brands. Well...almost, I know there are other brand vehicles equally difficult to work on. The difficulty with the 71-73 was just a sign of things to come. I have owned several Fox Mustangs and have enjoyed all of them. I have a 85 GT I ordered new and unfortunately have replaced several "High RPM" damaged heater cores. 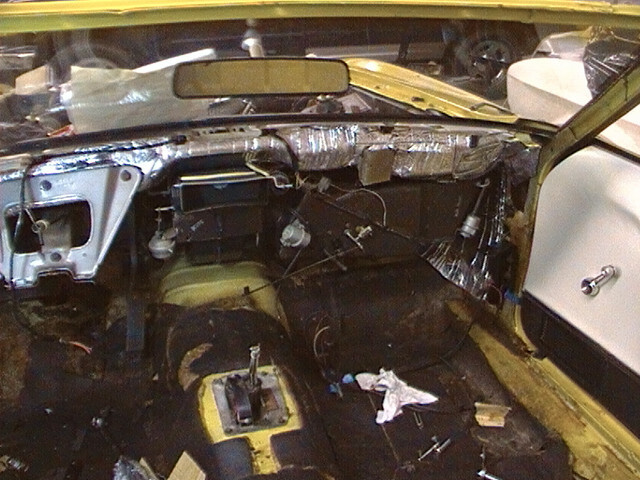 First section in shop manual, pull dash and place in front seats. Since it is a 5 speed, that also meant removing the console and the upper part of the shift lever. So another car where Ford started with a heater core and built a car around it! If an engineer who was responsible for the core design disappeared every time someone said a bad word about them, they would all be gone!! If you ever get a chance, look for any You Tube video showing a heater core replacement on a late 60's-early 70's full size Ford. I changed the heater core on my Dad's 69 LTD 390 V8 with air in 15 minutes. 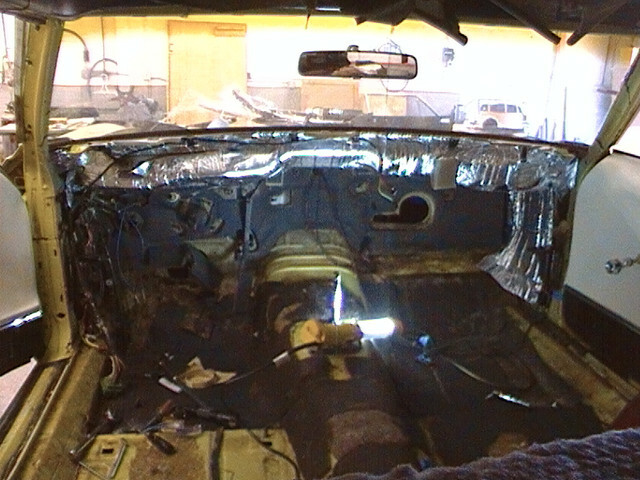 That was hood up, core replacement, top off coolant, hood down!! 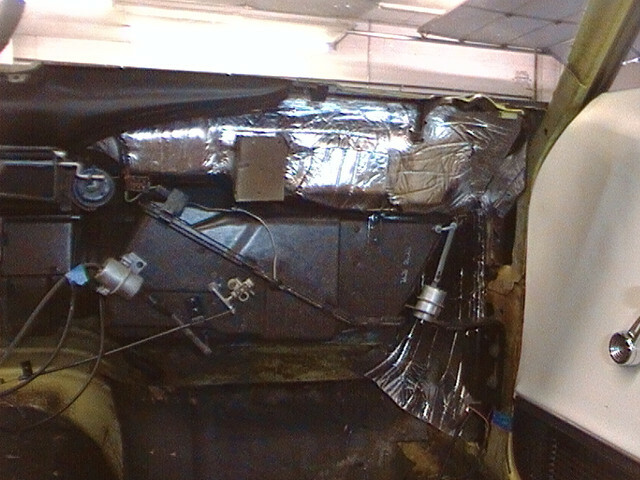 (06-06-2018, 10:40 AM)secluff Wrote: If you ever get a chance, look for any You Tube video showing a heater core replacement on a late 60's-early 70's full size Ford. I changed the heater core on my Dad's 69 LTD 390 V8 with air in 15 minutes. That was hood up, core replacement, top off coolant, hood down!! it's kind of a funny one too. Man, that's exactly what is missing on our cars! You miss the point. These cars were not designed to last that long. No primer or coating on steel either. I was engineering manager at largest lawn equipment mfg. in the world. People always wanted to know why we did not do some things better. The answer is a riding lawn mower for home use has a design life of 350 hours no more. That is John Deere, Husqvarna, Sears, Honda etc. Yes they will last longer but not designed to. A commercial mower is designed for a life of 1,000 hours before major work, big difference and also big difference in price. On the assembly line putting the heater box in is a simple job and most stations in the assembly process are 2 min. or less. I mean go on line and watch one man drop engine and transmission in our cars in seconds. As far as the R-12 I have an R-12 removal pump if you were closer we could just take it out and put it back. I also have a friend that still has a case of R-12 if you just have to stick with it. I put Dura Cool in my 73 and it takes a very small amount to fill the system. You do have to change the O-rings and lube. The Ford manuals have very little detail on removing the heater boxes. I just would never try to do it in the car without removal. 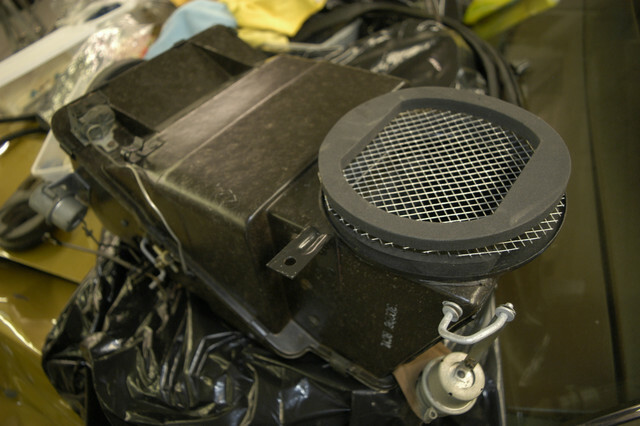 I just rebuilt my non air box for my 72 Q vert and wrapped it up. I do need a new blower motor bearing split in half on one end. I took apart to clean and lube and found it. Fabrice, that was a funny video. He was sure happy to have heat again. 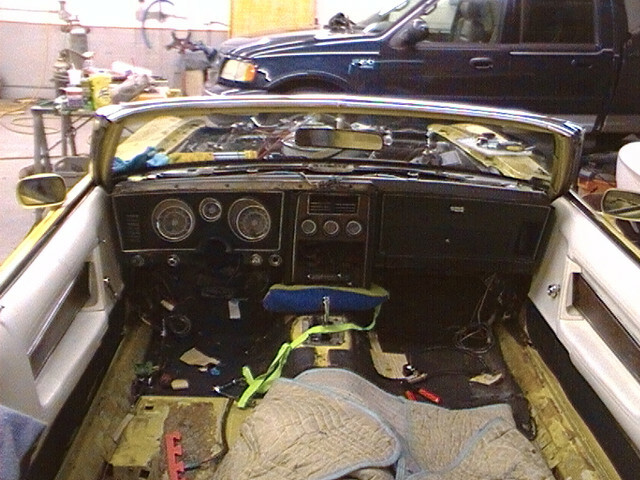 That was a 74 LTD without factory AC so the case is a little different with the heater core coming out from the front. 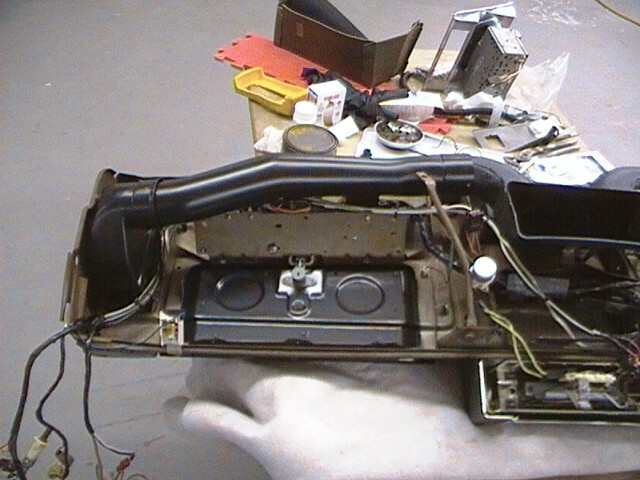 From 69-78 the Factory AC cars had the heater core with the tubes at the top of the evaporator case. The illustration shows a 69 LTD with the arrow pointing to the cover. 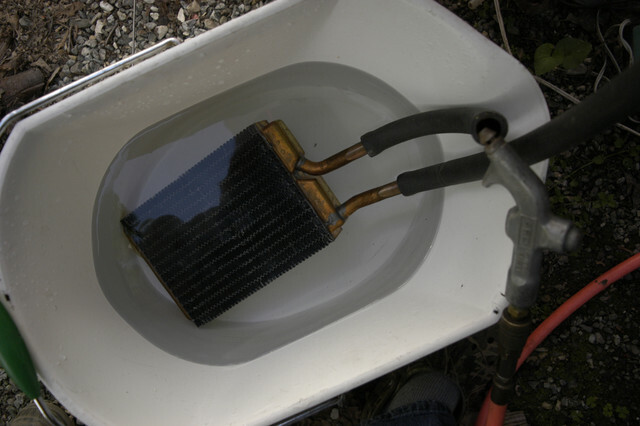 Remove the heater hoses, (6) #10 hexagon headed screws holding the cover on, pull the core straight up, reverse the procedure and your done!! You are totally right, they should not only be sentenced to service heater cores, they should do some sanding and rust treatment as well! Oh I see! Its obvious the guy who designed this had to replace a heater core at some point in his life! Ok I went and got the R-12 my friend had stashed if you want to use R-12 you can. I have 16, 12oz. cans and 4, 4 oz. cans of Du Pont Freon 12. I do not know the restrictions on shipping but will see if I can locate some info. I also do not know the current market price but will see if I can find. 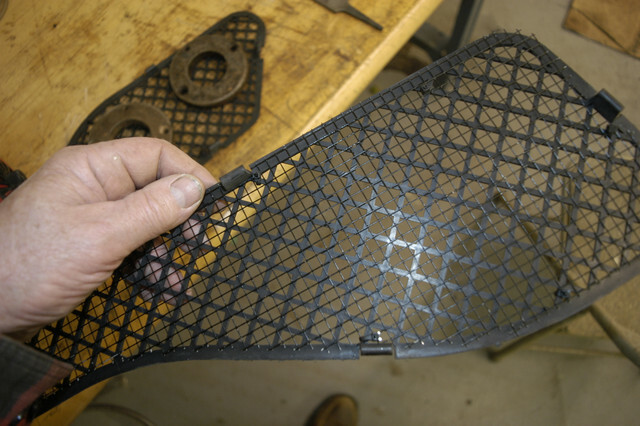 This would allow you to keep the stock valves at the fill and gauge hook ups if you want to be 100% pure stock. I still personally do not get upset at changing the core by removing the dash. I would go crazy trying to do inside the car. the foam inside the case will be falling apart due to age alone. Just unbolt the dash and slide back far enough to get the box out. I did an econoline van twice in one day due to the first core having a hole in it when new. That is why I always test now. You have to pull the dash on them also. 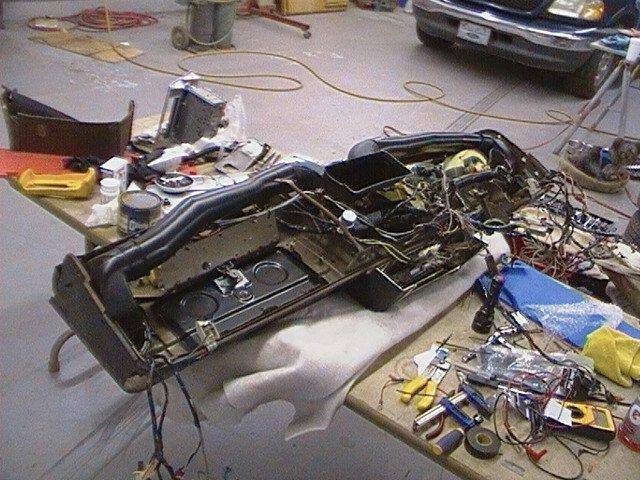 Heck you can take the whole car apart in 30 hours I just did one and no air tools. I do have lift and engine hoist. I quoted to a lady that works at local ABC store a replace on her Jeep which requires dash to come out also. I told her I would do it for half what the Jeep dealer would quote and she still has no heat, lol. Freon is here first come first serve. It looks like the pics will not load, had same issue doing PM a while ago could not get pic to load. Is it me or the system changed? Will try a screen print. That did not work either says "Request Entity Too Large" in the error report.